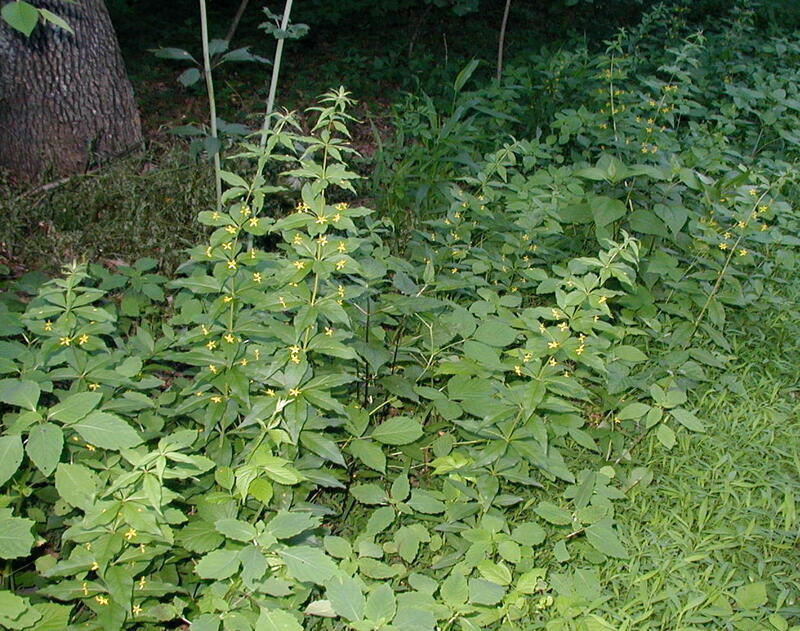 Late May to early June is the blooming time for Whorled Loosestrife, Lysimachia quadrifolia in Pennsylvania, in particular South-central PA. 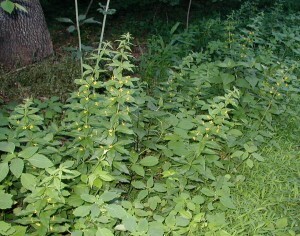 These delicate loosestrife plants are about two feet tall and have lance-shaped leaves in whorls. 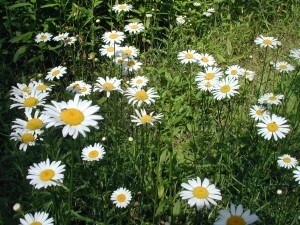 You can find them flowering in open woods, at the edges of fields and along hiking trails. About a dozen plants of Whorled Loosestrife blooming in the open woods. 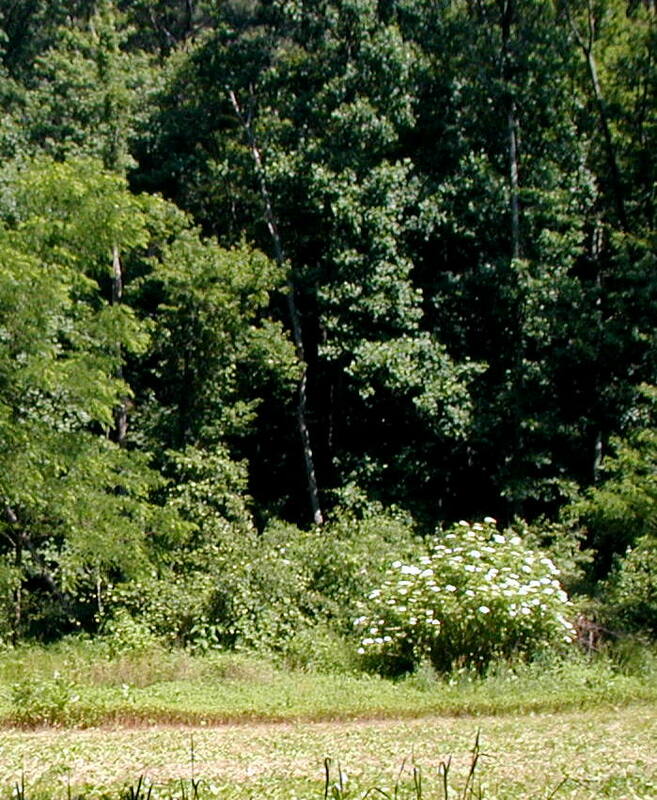 Cohorts include Spotted Touch-Me-Nots and blackberry vines. Photo above taken 8 June 2010. Flower buds project well over the whorled leaves, one flower for each leaf. Whorls have typically four leaves and flowers but on the mountain ridge here we often see whorls of five. More rarely plants will have whorls of three. Photo above taken 31 May 2010. Flowers and leaves in whorls. 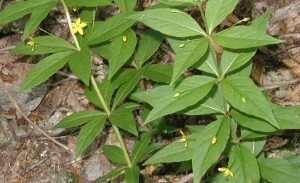 In the photo above taken 31 May 2010 the Whorled Loosestrife plant on the left has five leaves per whorl and the one on the right has four leaves per whorl. 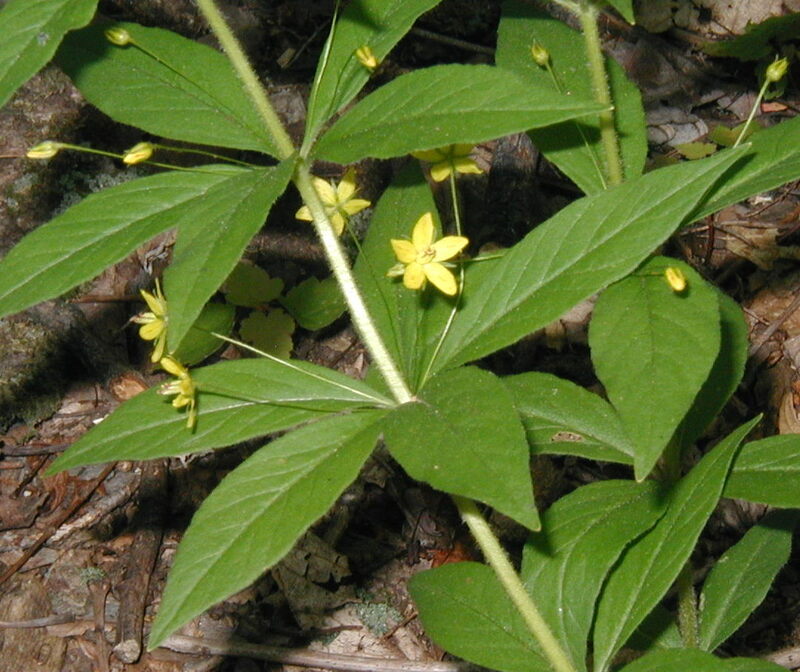 The flowers are truly star-like with five golden-yellow petals. Each has red dots around the center of the flower. About a dozen plants of Whorled Loosestrife blooming in the open woods. Cohorts include Spotted Touch-Me-Nots and blackberry vines. Flower buds project well over the whorled leaves, one flower for each leaf. Whorls have typically four leaves and flowers but we often see whorls of five. The flowers are truly star-like with five golden yellow petals. Each has red dots around the center of the flower. The Asiatic Dayflower, Commelina communis, is a cute three petal flower with two upper blue petals and one lower white petal. The lower white petal is so thin or narrow that often it is not even noticeable. The two larger blue petals stand out like Mickey Mouse ears. Long stamens stand out and anthers are bright yellow. 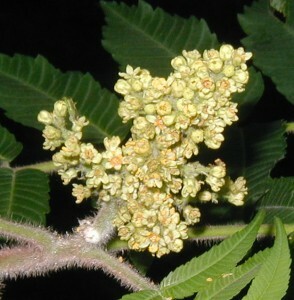 A sheath is underneath each flower as a sort of pocket. Three-petal bloom of the Asiatic Dayflower. In the photo above taken 6 June 2010, the thinner stem to the left of the larger stem on the right is that of the Asiatic Dayflower. Note the oval pointed leaves and the sheath that houses the flower until blooming time. 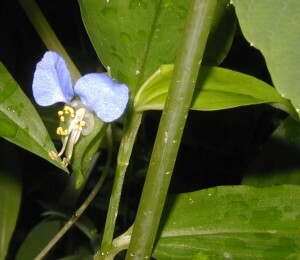 A related plant called Virginia Dayflower, Commelina virginica, has three blue petals and otherwise the flower appears the same as the Asiatic Dayflower. The Virginia Dayflower is native to Eastern North America, but it’s very rare compared to the alien Asiatic Dayflower. Dayflowers are named appropriately as they bloom for only one day, so they’re no good for cut flower arrangements. 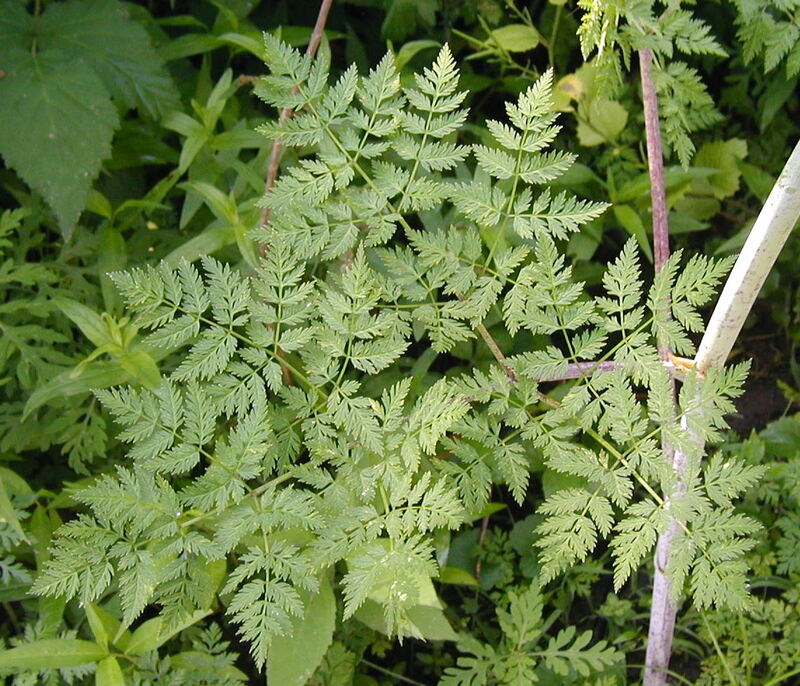 Leaves are linear-veined, pointed ovals that sheath the stem. 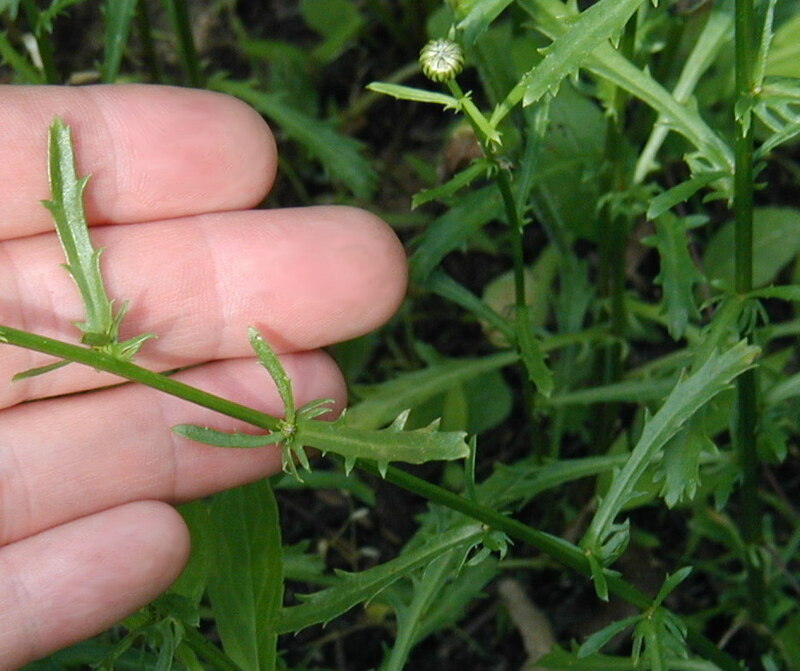 These plants spread by laying down their stems and rooting at the leaf nodes. This reclining habit also helps to differentiate the Asiatic Dayflower from the native dayflowers, which grow in an erect posture. Asiatic Dayflowers photographed here were growing along the upper west lane near blackberries in a partially shaded area with Spotted Touch-Me-Nots. Much better pictures of the Asiatic Dayflower can be seen in an earlier post about it blooming in South-central PA.
Peterson’s Edible Plant Guide indicates the dayflowers are edible and may be enjoyed by adding young stems and leaves to salads or using them as cooked greens. Elderflowers bloom at the end of spring and the beginning of summer and ripen into dark purple elderberries by the end of summer. Tall elderberry shrub reaches for the sunlight. 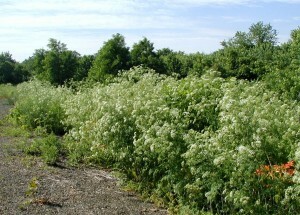 In the photo above taken 6 June 2010 there are over 3 dozen elderflower clusters. Additional flower clusters were observed blooming on the same plant on 22 June 2010. The flower clusters occur at tips of branches. When the elderberries ripen they get heavy enough to bend the branches down. Berries are ripe for picking when the clusters hang down and are very dark purple. Elderberry shrubs, Sambucus canadensis, have large, opposite, pinnately compound leaves with leaflets opposite one another. 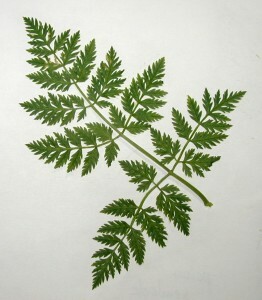 Toothed leaflets are lance-shaped and occur in pairs except for the terminal leaflet. Elderflower cluster and compound leaves. 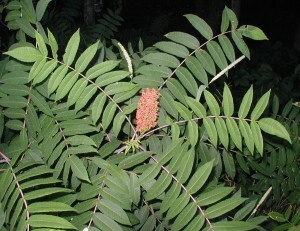 Note that the upper right leaf has nine toothed leaflets. The flower cluster rises up from the terminal end of the branch between two compound leaves. 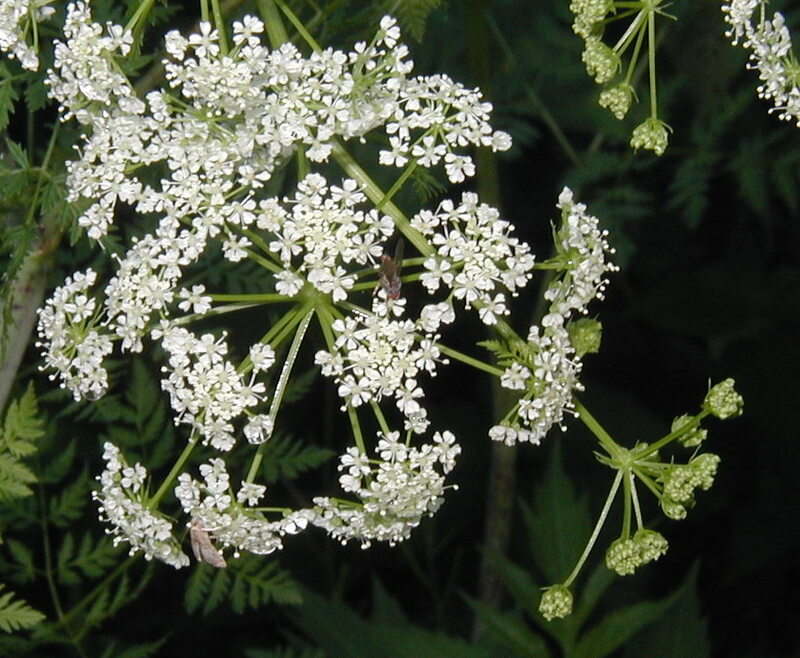 Individual elderflowers are creamy white with five rounded petals and protruding stamens, which gives the flower cluster a fuzzy appearance from a distance. 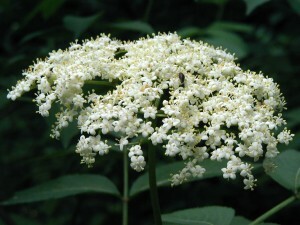 Close-up view of an elderflower cluster. All around the area we see elderflower bushes at the edge of fields, where the trees meet the open sunny fields. 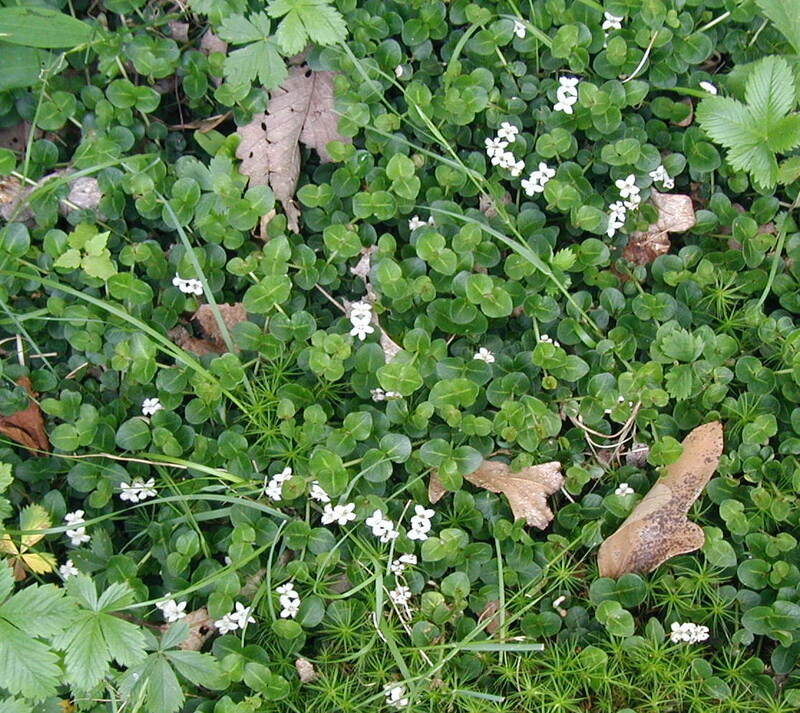 Many bushes are growing near water, in culverts, in drainage areas, and near streams. 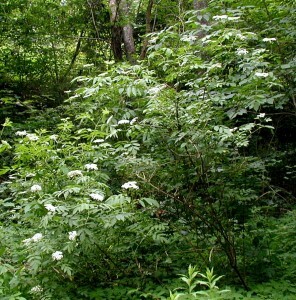 The tall elder shrub photographed above grows next to the edge of a lane where a natural spring trickles water down the side of the road, especially in Springtime and after heavy rains. A common elderberry bush at the edge of a farmer's field. Photo taken 10 June 2010. 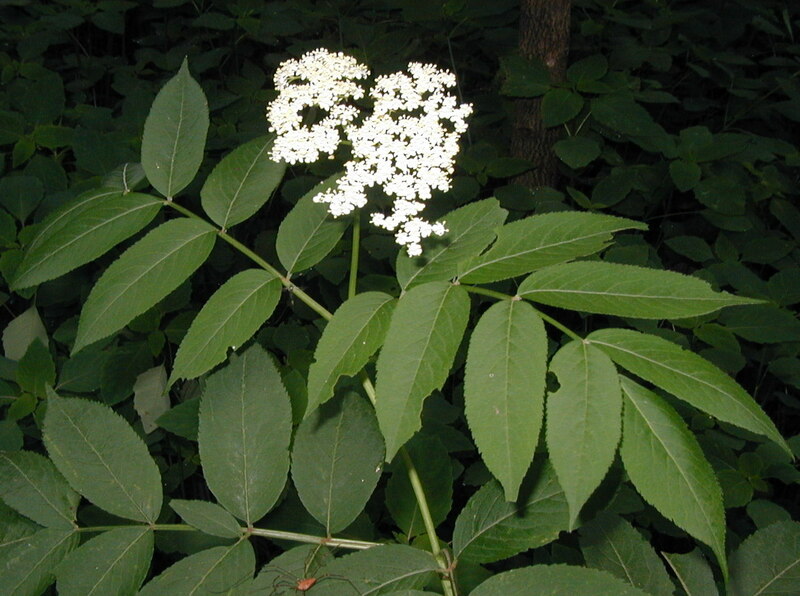 When the elderberry bushes are in bloom is the best time to find these shrubs if you’re going to collect the elderberries. The berries won’t ripen until late summer. By then we’ll be ready to make elderberry jelly! 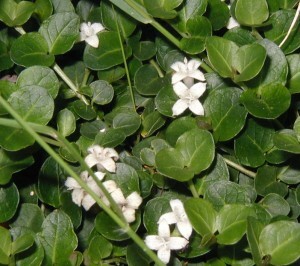 Partridgeberry, Mitchella repens, is a member of the Madder Family, Rubiaceae. 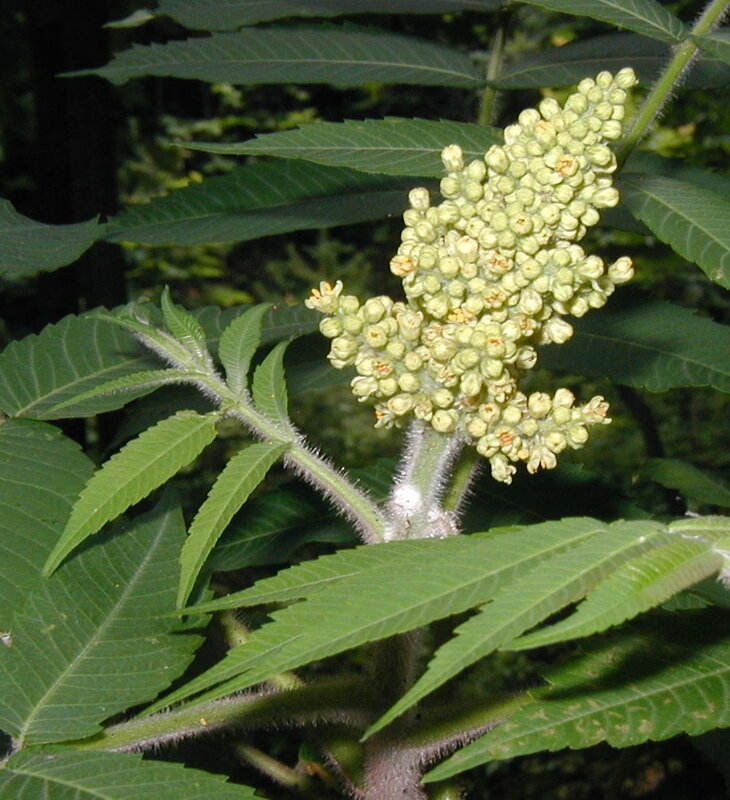 It’s one of the plants that just make me think, “Forest Flowers.” You won’t find it growing anywhere else but in a forest or perhaps in a shade garden. Partridgeberry is native to the Eastern North America. The terminal white or pink trumpet-like flowers are fragrant. The four petals are fuzzy-looking due to hairs on the inside of the petals. Twin flowers seem to be connected at their bases by a common stipule. 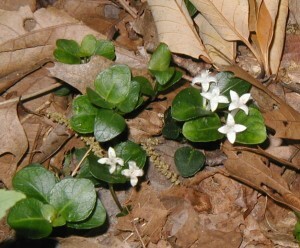 Small, rounded opposite leaves and twin flowers of partridgeberry. Stems are creeping with small, opposite, leathery, round evergreen leaves. 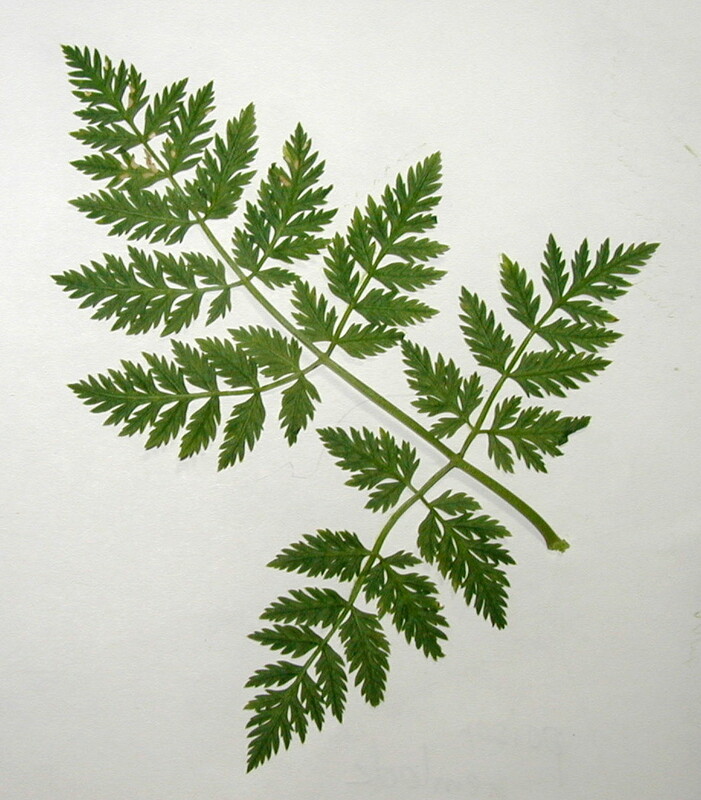 Leaves usually have a light-colored midrib and sometimes the other leaf veins stand out with a lighter color. Leaves are otherwise dark green and entire, or untoothed. Low-growing partridgeberry with its twin flowers. 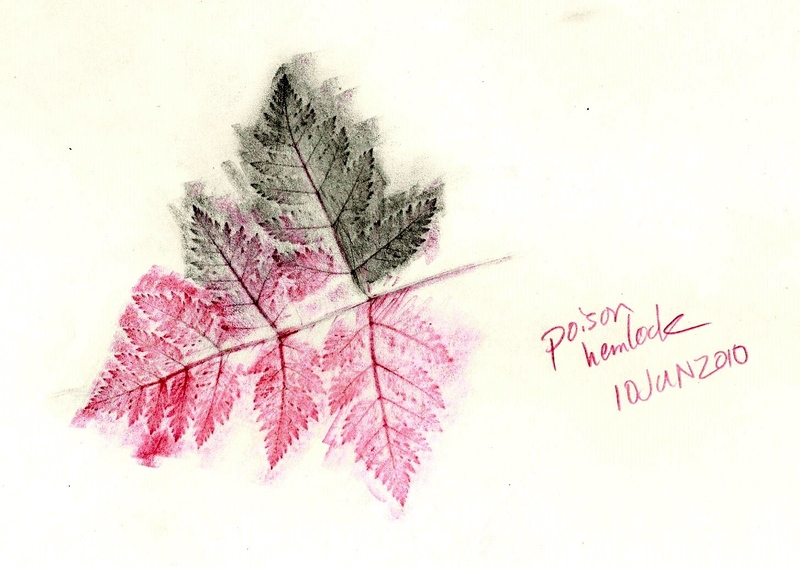 Partridgeberry on the forest floor with old oak leaves. Photo taken 3 June 2010. Twin flowers coalesce into a single red berry that may last through winter and remain at the tip of the vine until Spring. Peterson’s Edible Plant Guide tells us the berry is edible – it just doesn’t taste like anything. The tasteless berries can be used as a survival food or added to salads for a bit of color. Partridgeberry does seem to have medicinal properties. A leaf or berry tea was used historically for treating female problems, such as irregular or painful periods and childbirth pain, which lent partridgeberry the nickname Squaw Vine. 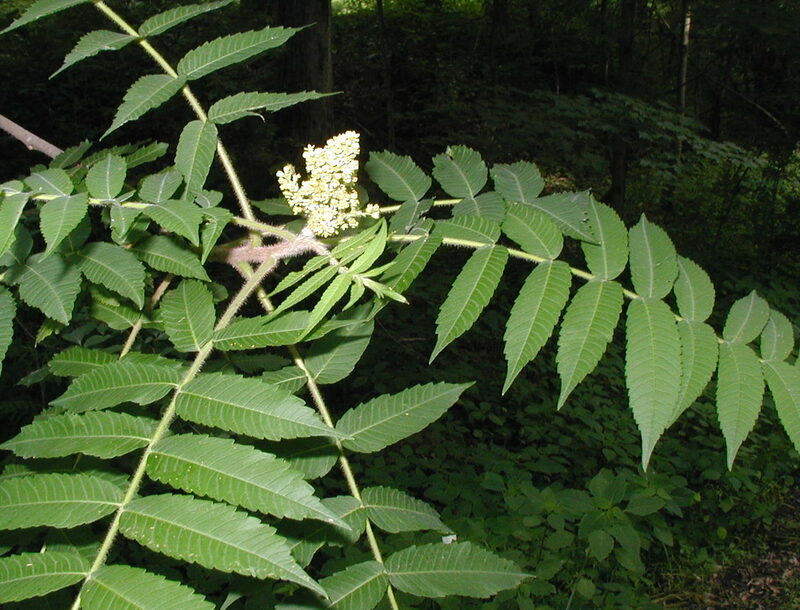 Astringent qualities of the tea led to its external use for skin irritations and as a wash to soothe arthritis. The group of Solomon’s Seal plants look similar, especially early in the year when the greenery is just coming up. 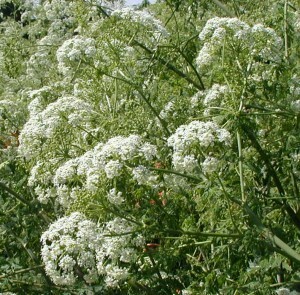 They all have parallel-veined leaves along a single arching stem and six-pointed flowers. 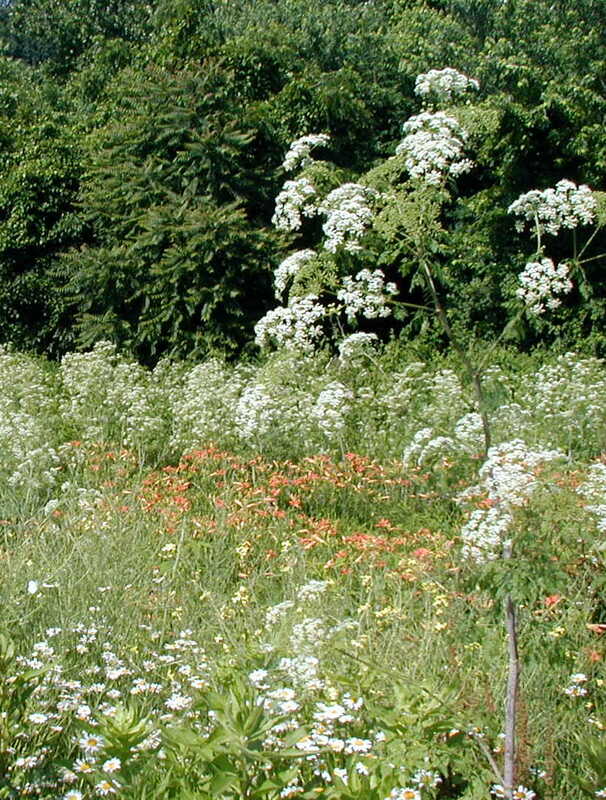 The plants themselves are different enough to warrant being placed in two different genera. At one time the Solomon’s Seals were all considered members of the Lily Family, Liliaceae. 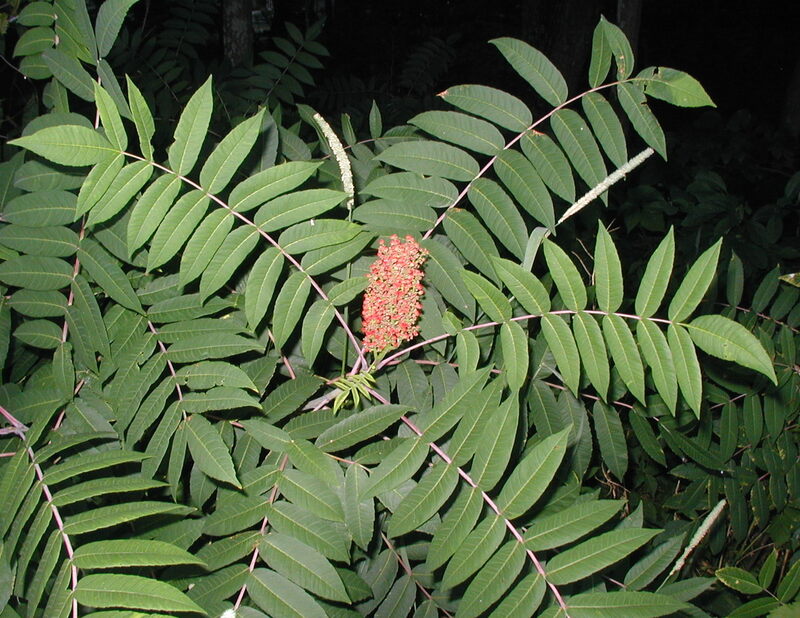 Further research resulted in their classification as members of the Ruscaceae Family, but that is now in question. Naming and classifying plants is not an easy task as there are several plant taxonomy systems that one might follow. Here at wildeherb we tend to follow the old Cronquist system with its major divisions of Monocots and Dicots, but we do take efforts to highlight accepted newer names for our vegetative friends. 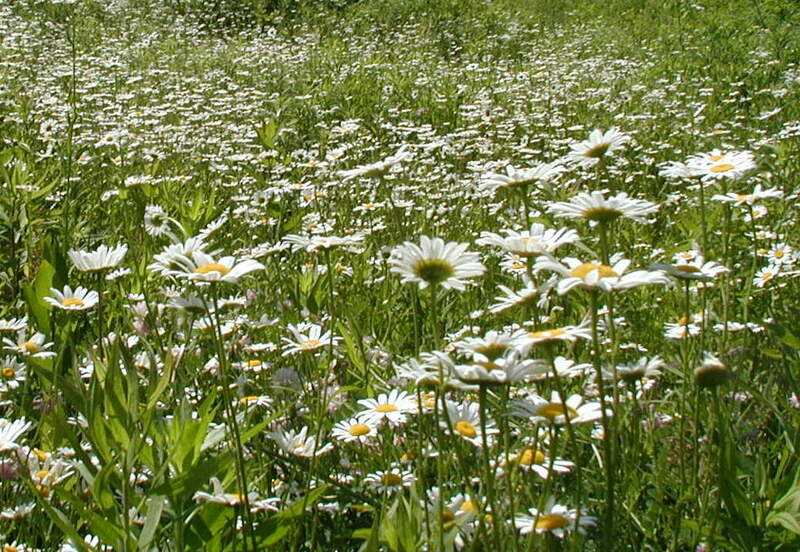 Blossoms tell the story as far as which plants belong to which species. After all flowers are the reproductive parts of the plant. The central idea of a species is that members of a species will be able to reproduce the next generation. Species are isolated from one another by not being able to cross breed or interbreed to produce viable offspring. Hybrid species can be formed, but they do not contribute to the furthering of either parent species. 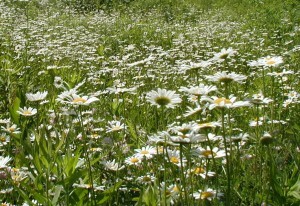 Comparing flowers, or deciding which plants are of the same species, often comes down to comparison of the floral parts. A case in point is Whorled Pogonia, a native orchid that we were lucky enough to see blooming in 2010 here on the mountain top. Another example where we need to compare floral parts to for sure distinguish the species from each other are the Solomon’s Seals. The leaves for these related plants could be described as linear, entire, oval shaped leaves having a short tip and arranged alternately along a single arching stem. Flower placement is axial or terminal in the Solomon’s Seals. 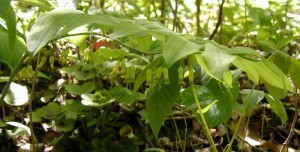 Axial flowers hang down from the leaf axils in two Polygonatum species. 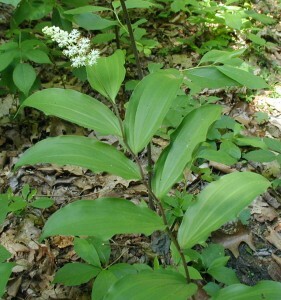 Terminal flowers grow at the tips of the arching stems in two Maianthemum species. Smooth Solomon’s Seal, P. biflorum, and Giant Solomon’s Seal, P. canaliculatum, have flowers that dangle from the leaf axils. Smooth Solomon’s Seal has typically two yellow-green bell-shaped flowers per leaf axil. Giant Solomon’s Seal has the same type of flower as Smooth, but they’re usually in a small cluster of 2-10 flowers. Also, the stature of Giant is usually much bigger than Smooth. Smooth Solomon's Seal with its dangling axial flowers. Photo above taken 30 April 2010. False Solomon’s Seal, M. racemosum, and False Starry Solomon’s Seal, M. stellatum, have their blossoms at the tip of the single arching stem. False Solomon’s Seal has a branched cluster of a few dozen small white blossoms. False Starry Solomon’s Seal has fewer, but larger, flowers and they come right off the main stem with no branching. False Solomon's Seal with its terminal cluster of flowers. Photo above taken 31 May 2007. Fruits are somewhat different among the Solomon’s Seals, but we’ll have to wait a while for them to turn from green into their final colors before making comparisons. 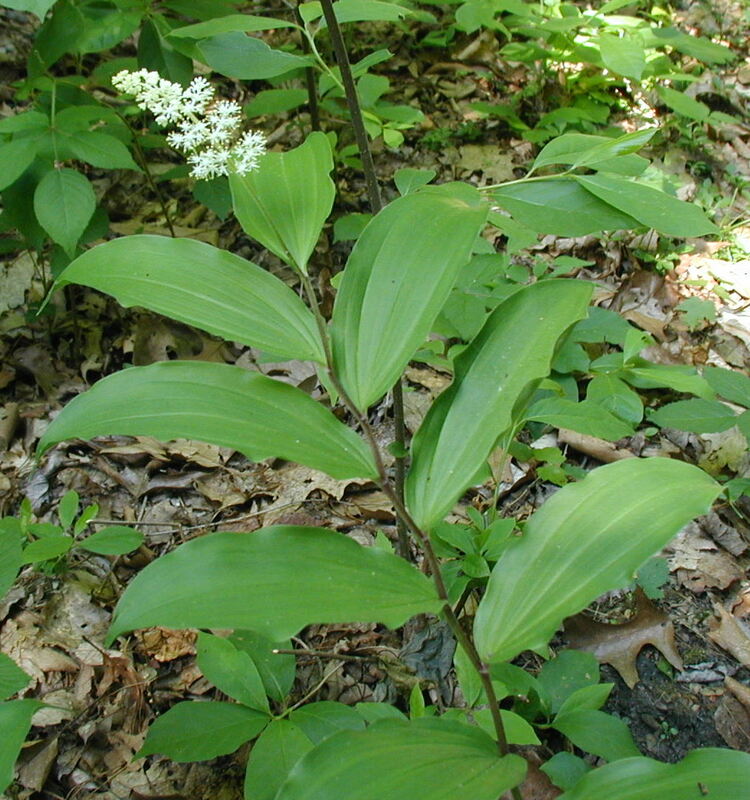 Incidentally, if you’re using an older wild plant guide the Maianthemum species are probably labeled as Smilacina species. False Solomon’s Seal may be listed as S. racemosa and False Starry Solomon’s Seal may be called S. stellata.